Plein Air painting creates a connection between the artist and the environment where the artist is painting. There is an immediate relationship and a sense of place to the natural environment that cannot always be duplicated from a studio painting from a photo. This painting of Truro Vineyards on Cape Cod in Truro, MA. was selected by a collector. It is such a compliment for an artist to have a piece of work chosen for a home. There is an intangible quality of interaction between the artist and a scene which goes beyond reporting of the visual elements and a painting. I would like to think that the collector senses that expression when they choose to place a painting in their environment. What a perfect day for painting it was at Fort Hill in Eastham, MA in the Cape Cod National Seashore! This photo shows the beginning of the painting that was inspired by the patterns of the water and wetlands at the shore. I was interested in capturing the clouds in the sky and the colorful wildflowers as beach peas in the foreground. Why do collectors choose certain paintings to hang on their walls? Perhaps that the image reminds them of a memory. When the weather is cloudy and not the best day for exploring the area, maybe the painting transports them to a special place and time. It is an intangible quality, but for the selection, I am grateful. I hope to have painted something that brings joy. I joined a group of plein air painters and the California Art Club who were painting on location at the Hagemann Ranch, which is listed on the National Historic Register in Livermore, CA . It was an overcast day a few weeks ago that turned to rain. Pastels and La Carte paper need to be sheltered from the elements, so I positioned my easel inside one of several barns on the ranch with a view of another barn outside the doorway. The actual scene in the foreground was a vacant parking area, so to improve the composition and to create a lead in I used some artistic license. I created a pathway into the scene surrounded by dry grasses in a warm tone which contrasts with the cooler tones of the barn. Although, I was painting in the shelter of a barn, since I painted most of this piece on site, I consider this a plein air painting. Do you agree? Sennelier La Carte paper, Pastels by Terry Ludwig, Sennelier, Unison, Rembrandt, NuPastels, and Conte pastel pencils. The Japanese Iris at the entryway of the Cape Cod Art Association caught my eye on a June afternoon for plein air painting. I loved the deep blues and purples against the many greens. The garden scene was fairly complex with bouganvillea, lilac, and azalea combined with the light and shadow patterns of the weathered shingled wall. There were areas of bright sunlight and deep shadow by the entrance. I am focusing on painting stronger light and shadow and this was a good opportunity for this. I omitted the sculptures on the right and cropped the trellis at the top for emphasis and composition. The Paint Out for Addison Art Gallery’s “After Hopper” in Wellfleet, MA was last Saturday. The event celebrates the artist Edward Hopper and continues the tradition of plein air painting iconic images of Cape Cod. I chose Mayo Beach and the oil house behind what was once the Mayo’s Beach Lighthouse on Kendrick Avenue. The pink and white beach roses which surround the simple painted brick outbuilding were in full bloom. Artists had the morning to paint and then deliver the finished work to the Wellfleet Public Library for an afternoon reception. This is often called a Quick Draw at other plein air paint outs. I planned my composition with a quick thumbnail sketch. With only a few hours to work from concept to completion, I thought the simple building that originally held the oil for the lighthouse would make for good painting that could feature the simple beauty of the Cape scene. The race against the clock is helpful to push me to capture the essence of the view and not get caught up in overworking a painting. I used the broken split rail fence that was surrounded by the roses as a directional element to draw the viewer into the focal point. I finished the pastel, framed it, and delivered it to the Wellfleet library to be hung for the reception to be held from 4 to 6 pm. Soon I was rewarded for my morning’s work, when a new collector chose “By the Sea” for a gift for his wife. I have memories of a beautiful day by the sea. 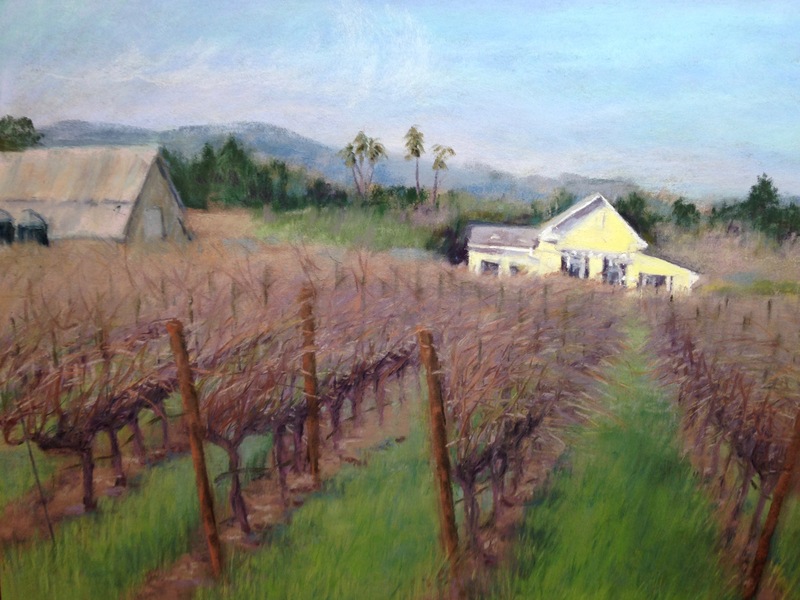 The roof line on the right of the house in my painting, “Yellow House in the Vineyard” got a repair. In my last post the house appeared to be falling into the ground. I raised the roof line on the sun porch and tweaked the area of the vineyard that overlapped that house. This is the beauty of working in pastel which is a very forgiving medium. It was a simple fix that involved removing the initial marks with a soft bristle brush before applying strokes of pastel. Here is the original that needed to be adjusted. I think the painting above is an improvement. The yellow house in the vineyard caught me eye one day when I was out on my usual walking route. 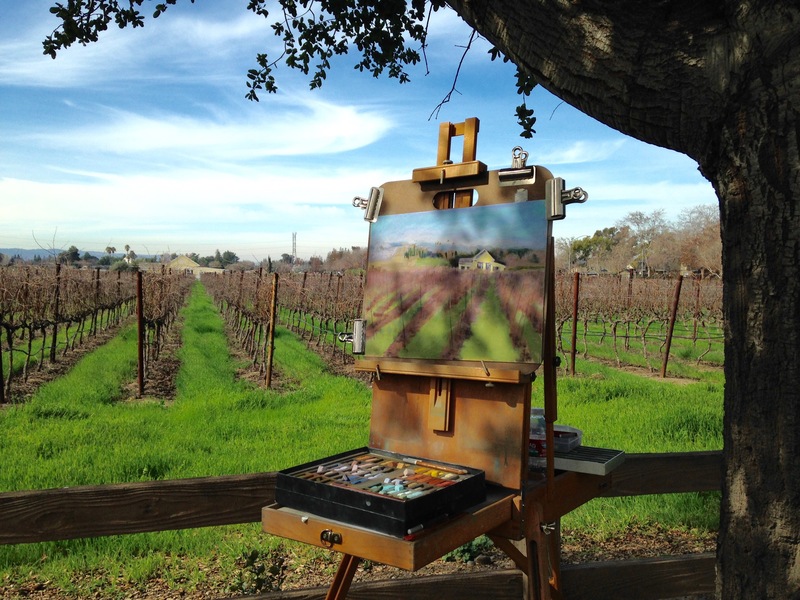 I returned with my painting gear of pastels and set up my easel at the edge of the vineyard last week. Soon, the growth on the grapevines will be pruned to stimulate the growth for the next season. I wanted to catch the vines at their wilder state despite the challenge of depicting the tangled vines. Of course, there is always room for artistic license. Painting Notes: Some of the background was simplified, so the focus was on the main elements of the scene, the barn, house, and rows of vines. To avoid a tangent of the barn roof and distant hills which, I added some height to the hills. Otherwise, the plein air painting is an accurate interpretation of the scene. Technical Notes: Pastels by Terry Ludwig, Rembrandt, Sennelier, Nu Pastel, and Conte Pastel Pencils on La Carte Sanded Paper.